Some mornings are just slipper mornings, but some days are just lazy slipper days. I not one who usually craves the sweat pant look, I save it for bed and long train trips, but yesterday with a full day of classes and exams ahead I couldn’t help it but feel the desire to be comfortable all day long. Recently Blue & Cream sent me a pair of Anniel boots. The italian label who specializes in sports foot wear created a line modeled after the classical dance shoe design. 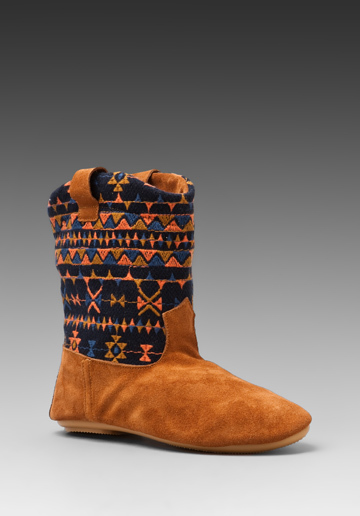 These boots are not only on trend with their navajo pattern, but the soft lining is enough to make me never want to take them off. Plus they had a little chicness to a simple pair of Monrow sweats, an Enza Costa tank, and a new favorite, a Charlotte Ronson hoodie. Sometimes comfort wins!